I adore the variety and abundance of fresh fruit available during the warmer months of the year. And if I can restrain myself from simply eating them as they are I love to use them in recipes. 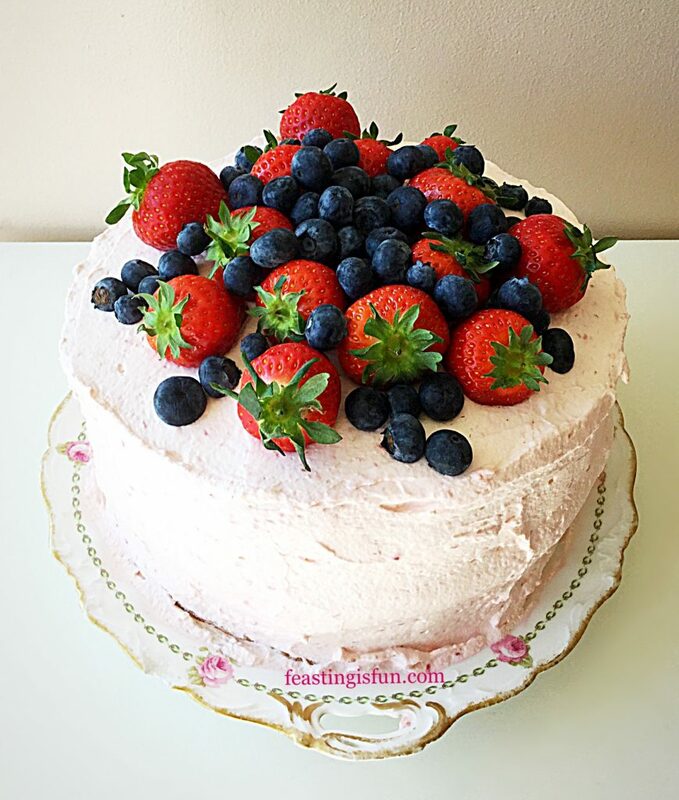 And here in my Summer Mixed Berry Sponge Cake they are given centre stage. 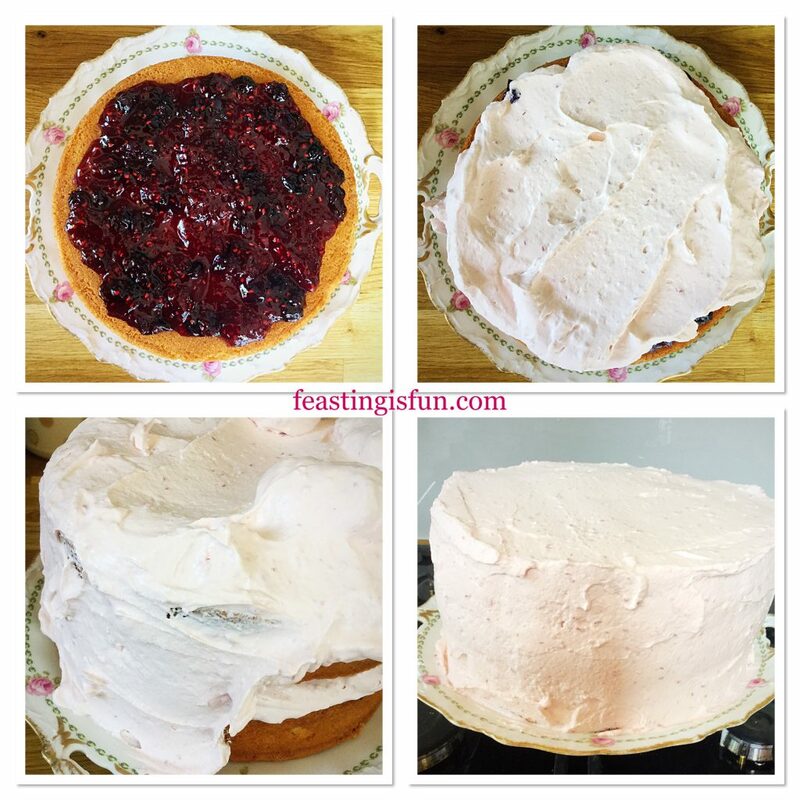 Freshly made raspberry and blueberry jam sandwiched between the two sponges with fresh raspberry whipped cream covering the entire cake. 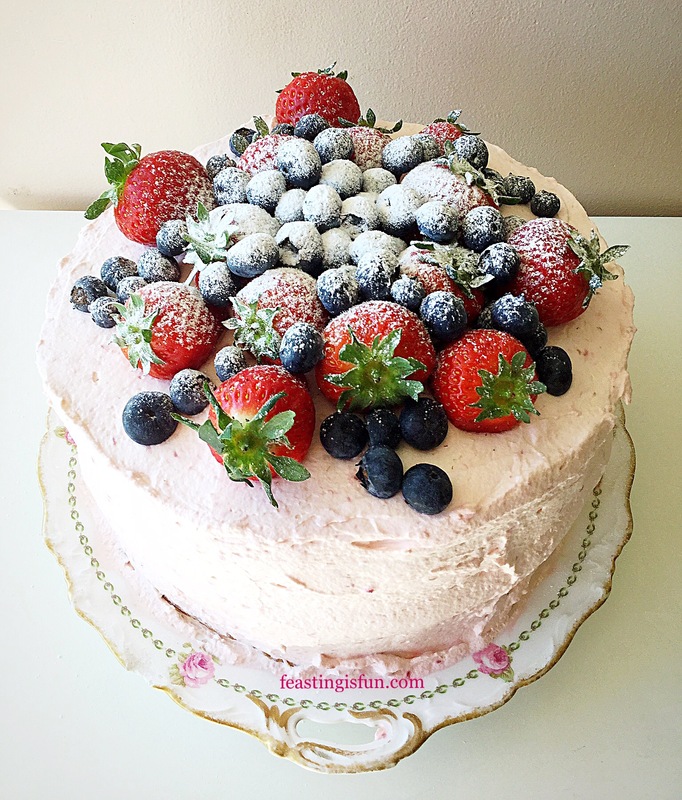 Finally topped with more fresh blueberries and strawberries this cake is a celebration of summer fruit. Because not everyone here at Feasting headquarters is a fan of sweet frosting, I decided to use something different to cover this cake. Fresh raspberries added to whipped cream are utterly delicious. While the raspberries are tart, when whipped into the cream they lend a sweetness and very light raspberry flavour. 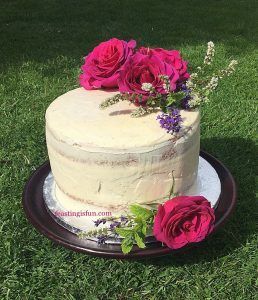 Since the cream is used between the sponges and to cover the cake it also adds a very pretty pink colour to the finished creation. 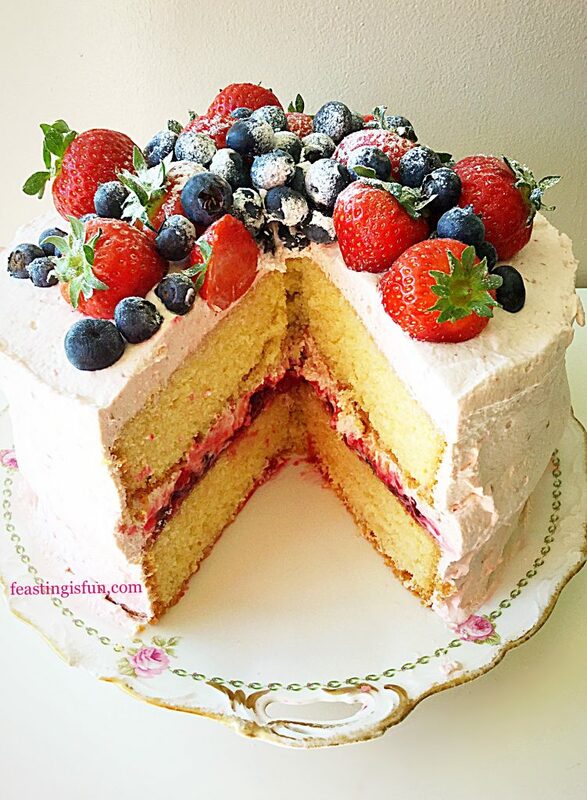 Finally the cake it topped with a tumble of seasonal strawberries and blueberries. Feel free to switch up and swap around the fruits according to what is abundant and available. Since I have blackberry, raspberry, tayberry, redcurrant, blackcurrant, strawberries AND a cherry tree in our garden I will have different choices as the season progresses. 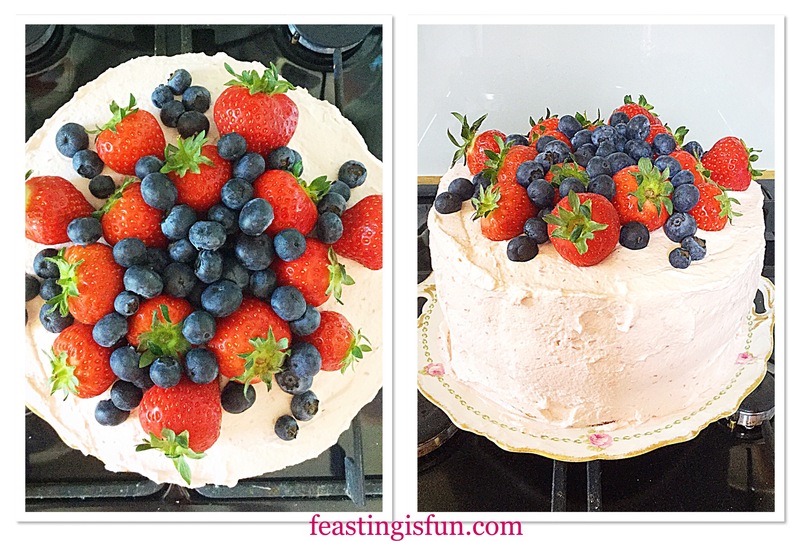 Also I am sure that strings of redcurrants dripping over the side of this cake will look really pretty. A guide for changing up the fruit is to keep at least one ‘sweet’ fruit for the top. Also I would be careful about adding strawberries to the whipped cream. Since they can be quite watery and may cause it to split. If in doubt, scoop a spoonful of whipped cream on to a plate and mash in a small amount whichever fruit you want to use. And the fruit should mix easily into the cream. Alternatively, if the mixture splits try a different fruit. You will need two 20cm/8in sandwich tins, buttered and lined on the base with baking parchment. First of all, into a large mixing bowl add the butter, sugar and salt. Whisk everything together until pale and creamy. Now add 2 eggs, vanilla extract and half of the flour. And whisk until just combined. Finally add the remaining flour and baking powder, 3 eggs and the lemon zest. Whisk together until everything is just combined. Over mixing will cause the cake to be dense. 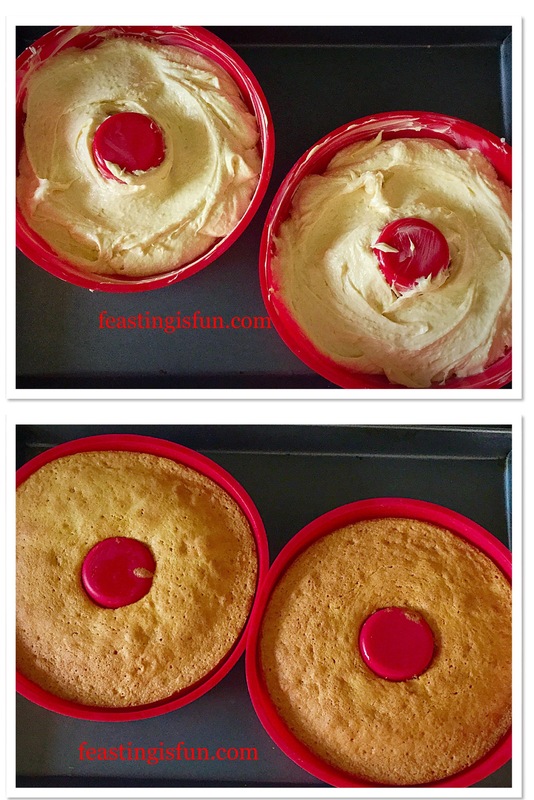 Divide the cake batter evenly between the sandwich tins. Place into the centre of the oven and bake for 35-40 minutes. 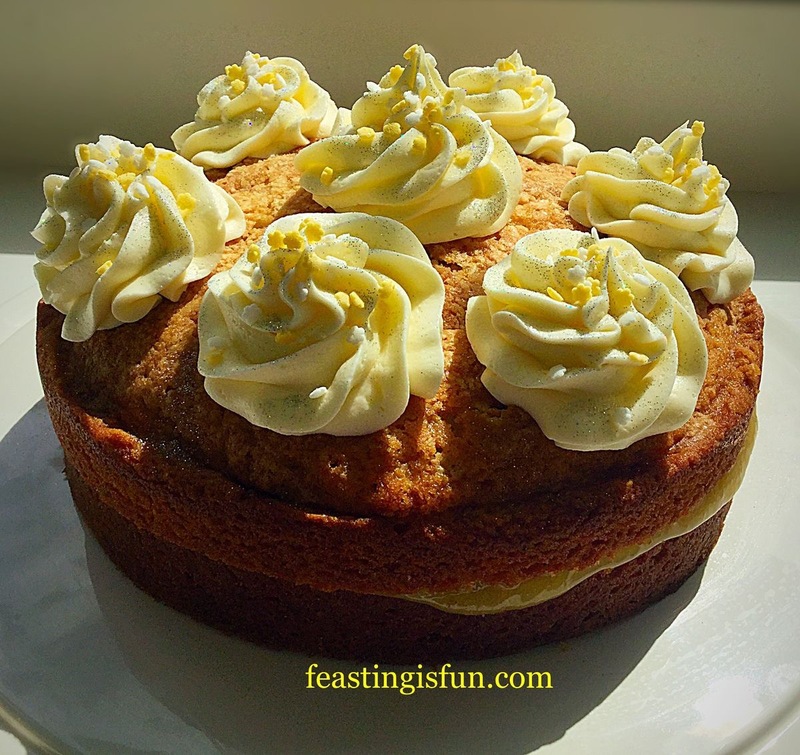 The sponge cakes are baked when golden in colour and firm to a light touch. Also an inserted skewer will come out clean. 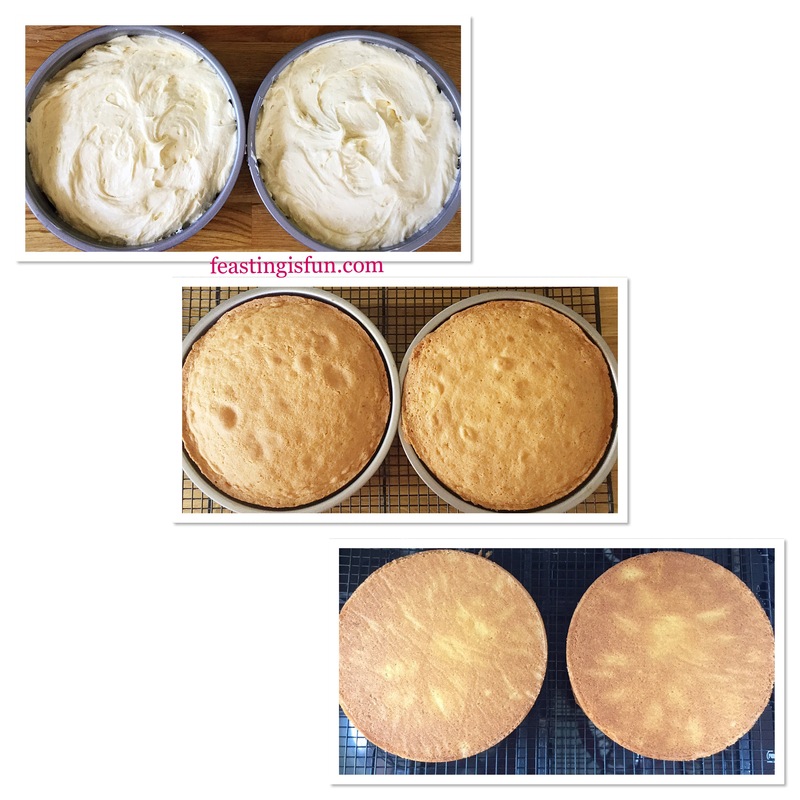 Leave the cakes to cool in the tin for 10 minutes, then turn the cake out carefully removing the baking parchment. Leave the cakes to fully cool on the rack. As soon as the cakes have cooled make the raspberry whipped cream. 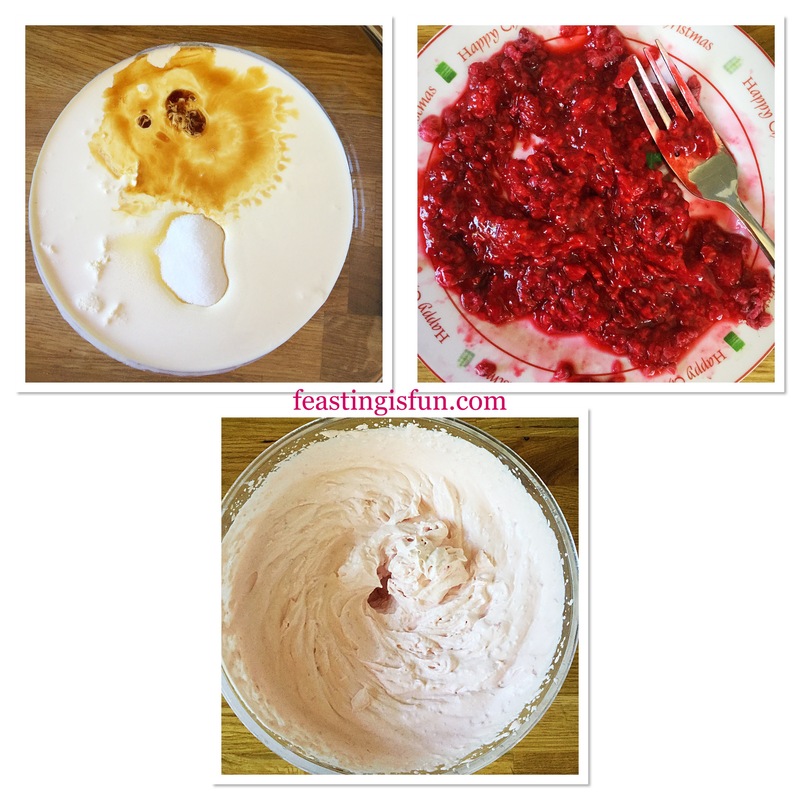 Place the fresh raspberries on to a plate and mash with a fork. Pour the cream, vanilla extract and sugar into a bowl and whisk until thickened but still floppy, not stiff. Add the mashed raspberries to the cream and continue to whisk until the cream has thickened and holds it’s shape. Place the first sponge, flat side up on to a plate or board. Spoon jam on to the sponge and spread to almost the edge. Leave a small gap around the rim of the sponge. Now spoon some of the raspberry cream on top of the jam. Spread the cream to the edge of the cake. Place the other sponge, flat side down, on top of the bottom sponge. Spoon plenty of raspberry cream on to the top of the cake. Using a palette knife push the cream on to the side of the cake. See photos above. Once all of the cake is covered with raspberry cream smooth the top and sides using a palette knife. Finally, with a clean piece of kitchen towel, wipe around the base of the cake, removing any excess cream. 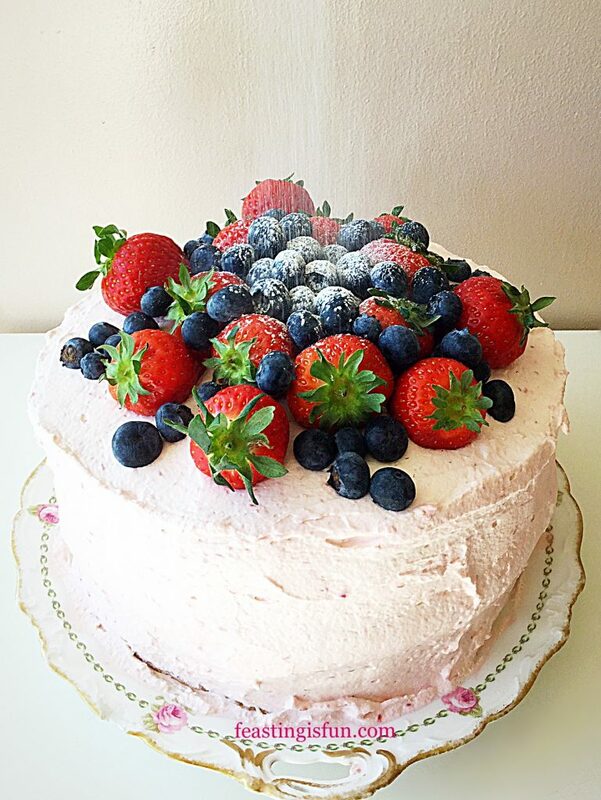 To finish the cake add fruit to the top. Importantly aim for a little height in the centre. Finally dust the top of the cake with icing sugar if desired. Place the finished cake into the fridge to chill for one hour. As soon as the cake is chilled it can be sliced and served. Also a useful tip is to wipe the cutting knife with kitchen paper after each cut. Doing so will keep the cake slices clean. The sponges can be made one day ahead and stored in an airtight container. Ideally this cake is best eaten the day it is assembled. 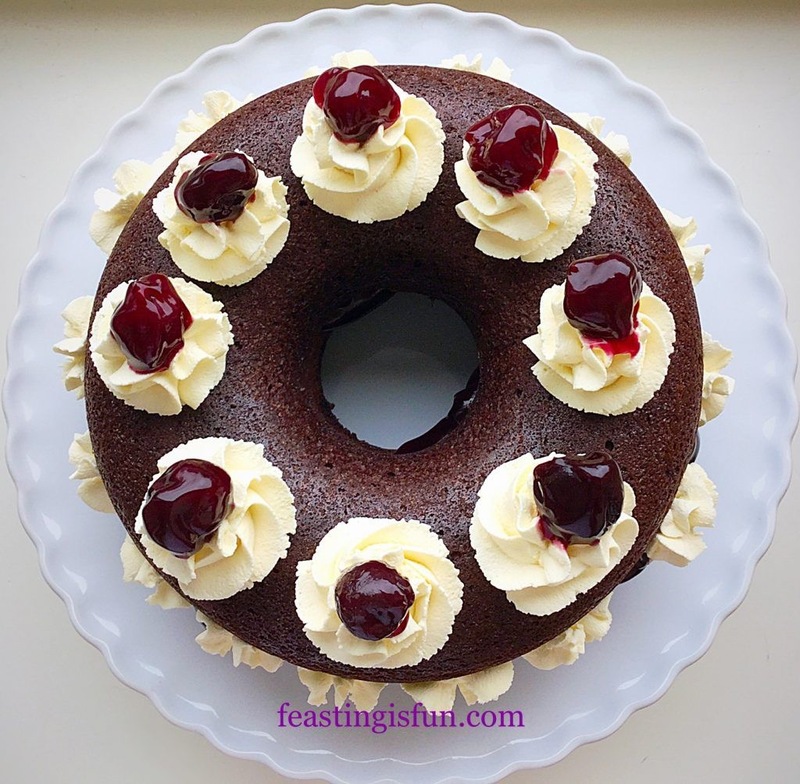 Store leftover cake in an airtight container in the fridge and eat within 3 days. Sharing this cake with friends and family gives me a real buzz. Because I do not sell anything that is made for this blog it also helps to keep our family healthy. While I can see how people may think we eat cake all of the time. We don’t! As a family cakes are treats for us too. Whatever you are making, baking and creating in your kitchens, I hope you have fun preparing and sharing your feast. 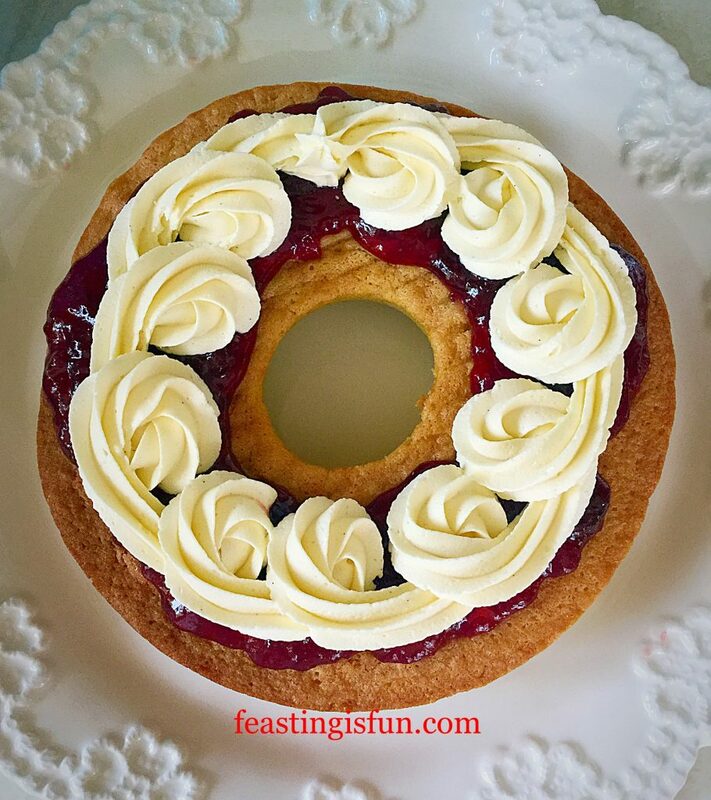 Ooh this Strawberry Whipped Cream Giant Doughnut has been made twice now, once using regular flour and then using gluten free flour. Nobody could tell the difference! Delicious, light vanilla sponge, sandwiched with strawberry jam, whipped cream and topped with chocolate piped strawberries. Strawberry Whipped Cream Giant Doughnut perfect with fresh summer fruit. 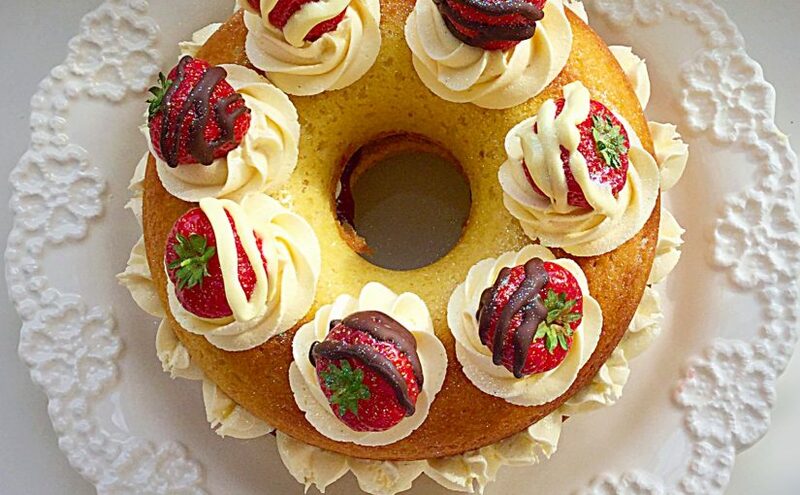 Piping the strawberries with white and dark chocolate takes this cake to the next level in terms of prettiness. That said, beautiful, lush summer strawberries, left un piped would still look fabulous. Strawberry Whipped Cream Giant Doughnut such a pretty cake. Having made this cake with both whipped cream and whipped buttercream, I have to say we all preferred the whipped cream. 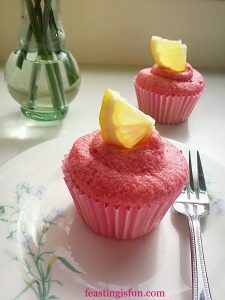 I have given quantities for buttercream in the recipe for those who prefer it. I don’t know about you, but I love making the most of our delicious, homegrown, seasonal strawberries in summer. Yes I am guilty of buying the occasional punnet of imported ones during the colder months. With the invention of poly tunnels and huge greenhouses, we are increasingly able to buy British grown berries over a longer period. Thank you farmers! 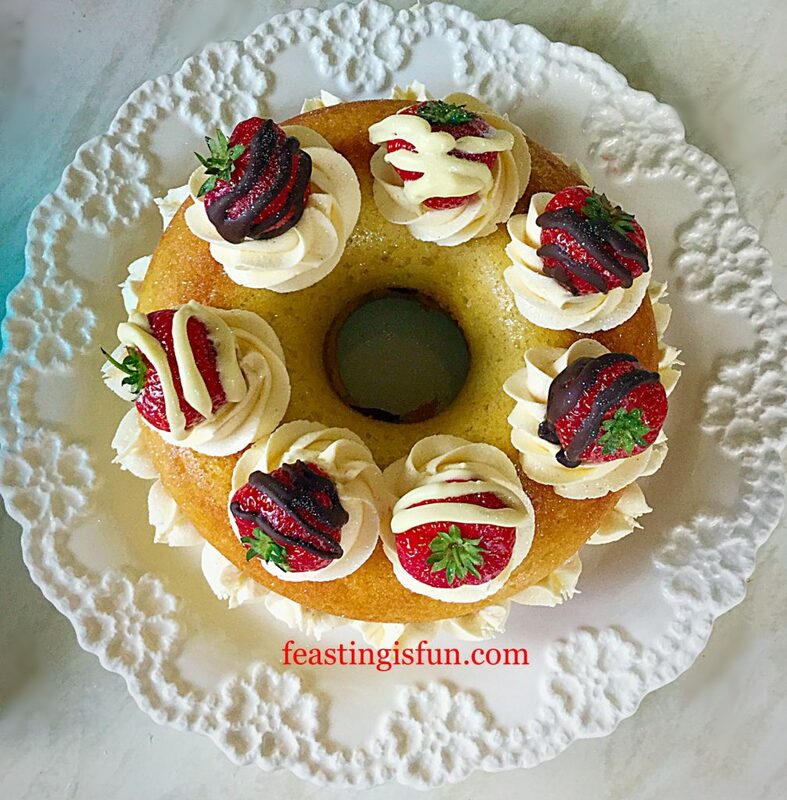 Strawberry Whipped Cream Giant Doughnut this is the gluten free version. As you can see from the photographs there is no real visual difference between the gluten free and regular Strawberry Whipped Cream Giant Doughnut. Only the size of the strawberries! The ones in the photo above were huge, which made them easier to pipe. Whereas the smaller ones were more tricky. 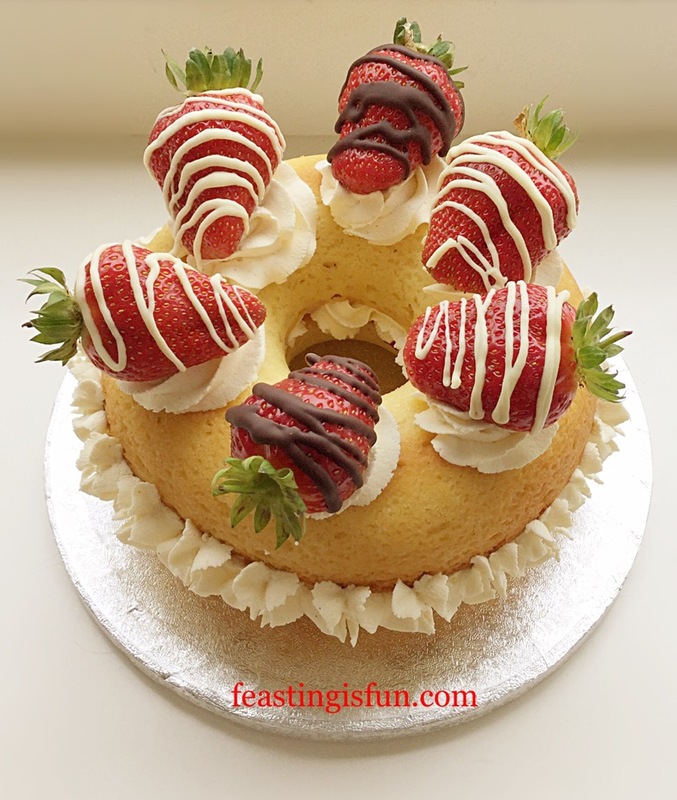 If possible choose longer strawberries as they look more effective with the piping on. That said, I’d definitely choose flavour over size any day. The strawberries above may have been big, but they were also utterly delicious! How do I tell if they are going to taste good? I smell them. If the punnet smells of warm summer strawberries they will taste delicious, however, if you can barely detect that delicious strawberry smell, move on as they will be bland. Both of these giant doughnuts were made to go with afternoon tea and they were a huge hit. 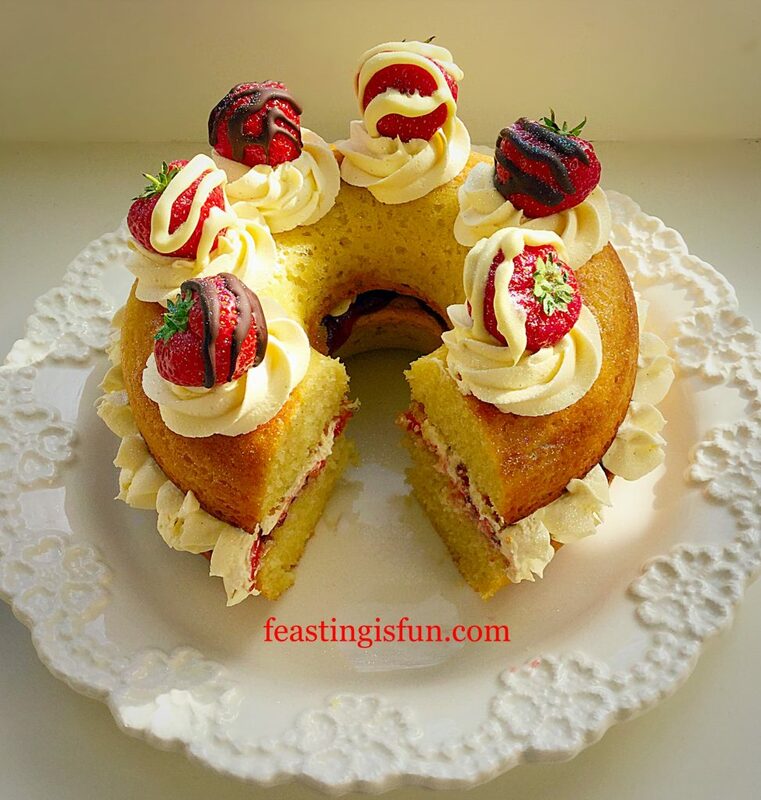 So, whether you are on a restricted diet or not, you can make this Strawberry Whipped Cream Giant Doughnut and feast! 225g/8oz Unsalted Butter at room temperature – plus a little extra for greasing the silicone doughnut moulds. Grease both the silicone doughnut moulds thoroughly with butter. Place on a large baking tray. Whisk/beat for a good few minutes – 5 minutes ideally – until pale and creamy. Add in the vanilla bean paste (or extract) and beat until incorporated. Next add all 5 eggs. Continue whisking/beating until the mixture is pale and creamy. If the mix looks as though it has split (curdled) add 1 tablespoon of the weighed flour, continue mixing and it will pull back together. Sift in the flour (gluten free or regular) and the baking powder. Fold in the flour until just combined. 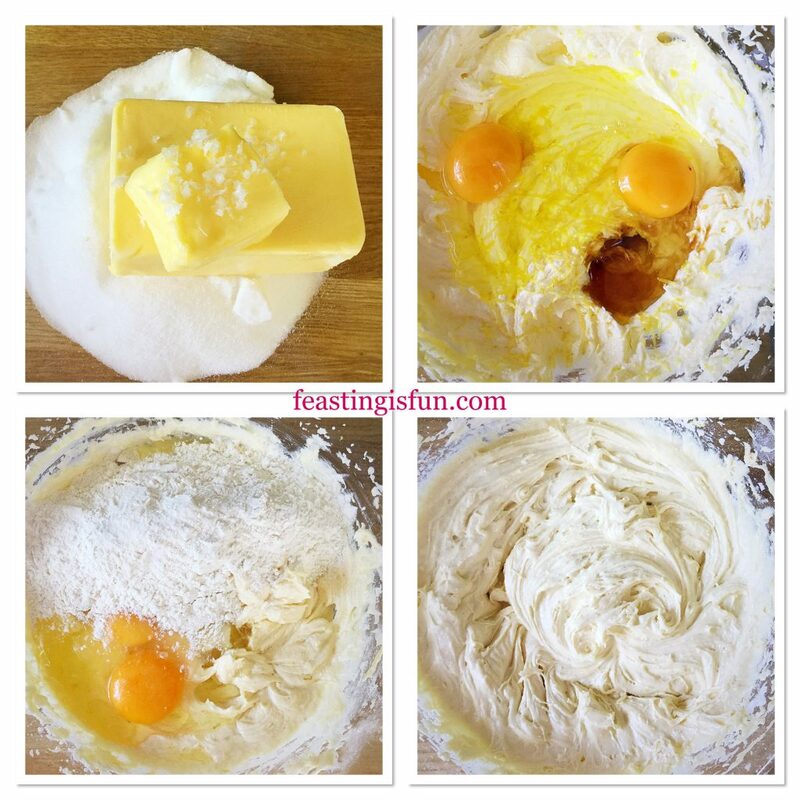 Divide the batter equally between the 2 doughnut moulds. These silicone doughnut moulds from Lakeland are so easy to use. Place the baking tray into the centre of the oven and bake for 30-40 minutes. 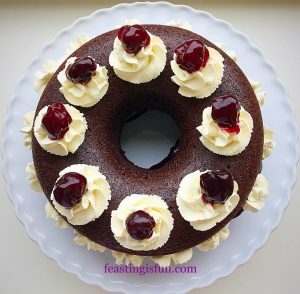 The sponge is baked when it is a golden colour and springs back when lightly pressed – note – the gluten free doughnut was slightly paler than the regular doughnut, this is nothing to worry about. Once baked remove the baking tray from the oven and allow the doughnuts to cool for 10 minutes before turning them out on to a cooling rack. Leave the doughnut halves to cool completely on the rack. Whilst the doughnut’s are cooling, break up the white and dark chocolate and place into separate heatproof, microwaveable bowls. Zap until just melting and stir until completely melted. Fill 2 small disposable piping bags with each melted chocolate. Snip off the very end, leaving a small hole. 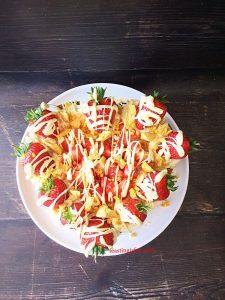 Place the strawberries on baking parchment or a silicone mat placed on a baking tray (helpful if you need to move them). Pipe some with white chocolate zig zags and others the same using dark chocolate. Allow to set, in hot weather pop in the fridge for a few minutes to set. When completely cooled place one doughnut half, flat side up on to a board or plate. Whisk the cream (or icing sugar/butter/vanilla) until it holds its shape (or until the buttercream is pale and creamy). Spoon the strawberry jam on to the base of the doughnut and spread so that it almost reaches the edges. Fill a disposable piping bag, fitted with a large star tip, with the cream/buttercream. Pipe some cream on top of the jam. 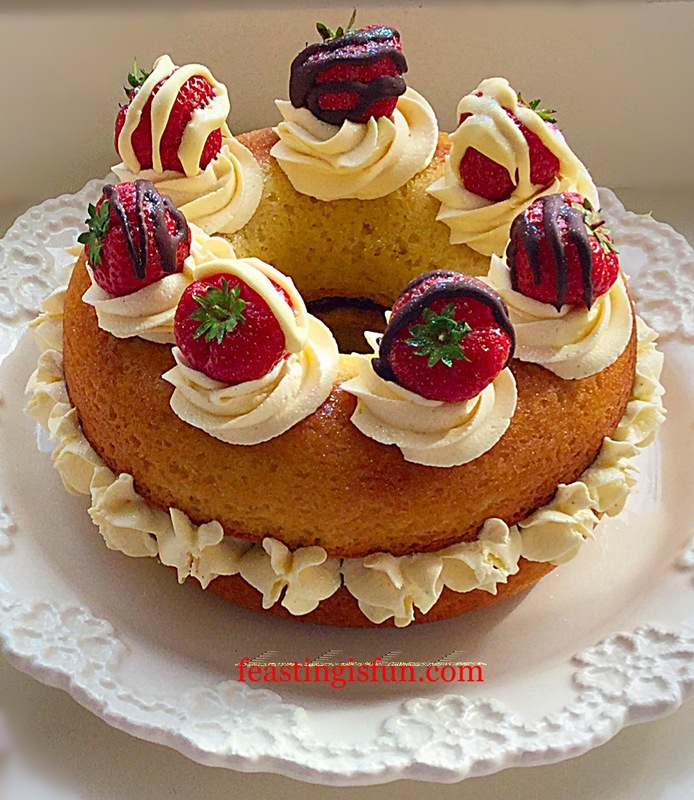 Strawberry Whipped Cream Giant Doughnut – luscious swirls of cream inside the doughnut! Place the other half of the doughnut, flat side down, on top of the base. Pipe swirls of cream/buttercream around the doughnut and then pipe stars around the centre, on the side. 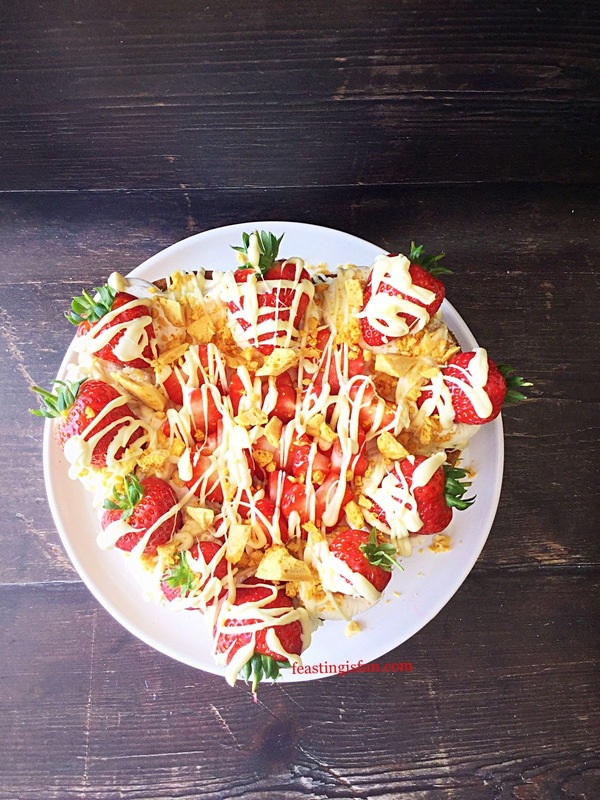 Top the swirls with chocolate piped strawberries and sprinkle with edible glitter. Beautiful swirls of whipped cream are topped with chocolate piped strawberries. 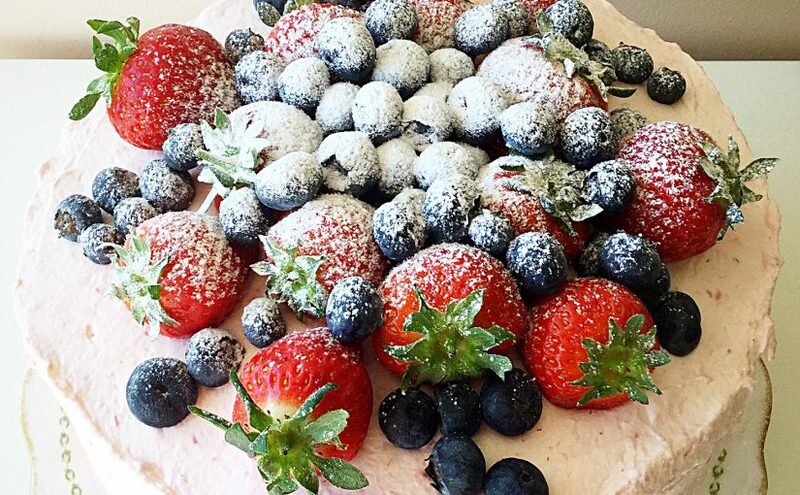 Make sure you take a photo of your beautiful Strawberry Whipped Cream Giant Doughnut, as once it is assembled I can guarantee that it will not last long! I have specified more strawberries in the recipe than you see on the cake. This is so that everyone gets a delicious, chocolate piped strawberry with their slice. Served with a proper cup of tea, I can think of no better way than feasting on this delicious treat any afternoon. 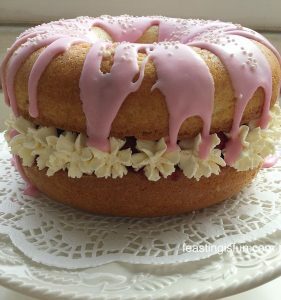 I bought the giant doughnut silicone mould from Lakeland at a silly price in the sale. That said, they are so much fun, I’d happily pay full price for one! The idea of Afternoon Tea really appeals to me. Even if I can’t be fussed to make finger sandwiches and the like, making a treat for Sunday afternoon, where we sit down and enjoy as a family, is becoming a tradition. 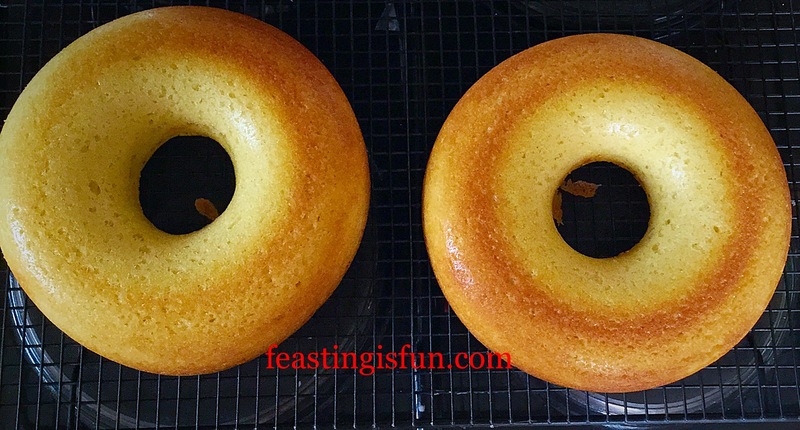 Quite often I will bake the cake/giant doughnut on the Saturday, ready for icing the following day. We give a lot of the sweet treats that I make away. Primarily because as a family we love sharing, we are also conscious of our health too. If you have family traditions I’d love to hear about them. Leave a comment for me to read in the comments section?